1. A 19th-century movement in painting, led by the pointillist Georges Seurat, that favored stricter and more formal techniques of composition than impressionism. 2. The doctrines and methods of a group of artists of the 19th century, based on a more strictly scientific practice of impressionist technique. 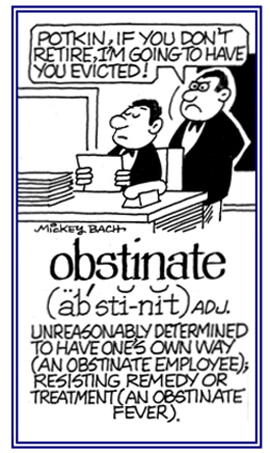 An obstruction that stands in the way or hinders progress, and which must be removed or surmounted or circumvented before it is possible to continue. 1. The branch of medical science concerned with childbirth and caring for and treating women in or in connection with childbirth. 2. Etymology: from about 1819, from obstetric, 1742; from Modern Latin obstetricus, "pertaining to a midwife"; from obstetrix (genitive of obstetricis), "midwife". Literally, "one who stands opposite (the woman giving birth)"; from obstare, "to stand opposite to". 1. Pertaining to keeping an opinion, a purpose, or a course of action in spite of reasons for not doing it or arguments against such behavior: Mark, the teacher, was trying to deal with an obstinate pupil who refused to put his cell phone away during class; so, the boy was sent to the principal. Despite the dangers of severe flood warnings, Ted and his family were too obstinate to leave their house for a safer area. 2. Relating to being very difficult to deal with and not easily overcome or removed: There was an obstinate stain on Jim's shirt which could not be removed even though it was washed twice. © ALL rights are reserved. The relative position of the eye in the orbit. 1. The act or condition of ejecting, forcing out, or supplanting. 2. To force out or to remove, as from a place e or position; to eject. 3. In law, the act of forcing someone out of possession or occupancy of material property to which he or she is entitled; illegal or wrongful dispossession. 4. Etymology: existing since about 1420, from Anglo-French oster (1292), from Old French oster, "put out, keep off, remove, avert"; from Latin obstare, "to stand opposite to, to block, to hinder"; from ob-, "against" + stare, "to stand". Showing page 12 out of 22 pages of 319 main-word entries or main-word-entry groups.